I agree that i have read and understand all of this item description, and i understand that this will require some set up and minor fabrication work, and is not fully "bolt on"
Front Scooter Fork Adapters for the Honda Grom! These adapters are what you need if you want to bring a whole new look and aggressive feel to your Honda GROM! 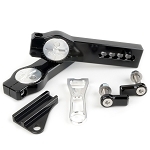 The Scooter Fork Adapters allow you to install an front fork RRGS/NCY Ruckus-style Fork Assembly on your Grom. Included in this setup are the two SOLID Billet 6061-T6 Aluminum Fork adapters. 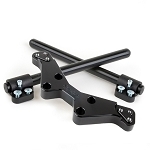 These are designed to install in place of the stock forks, and then allow you to slide a Honda Ruckus/Zoomer fork into the lower end of the adapter, and clamp it just like you would on a scooter. What considerations are there for installing this? If you use a fork such as an RRGS or NCY "low down" fork, your stock headlight WILL NOT FIT! You will need to do something custom for a headlight. Also, the front of the bike will be VERY low, and if you combine that with the 6" rear lowering link to get the exact same stance as our White MSX125, you WILL need to cut the stock kickstand mounting point off of the bottom of the frame, or the bike will not be able to lean without hitting on the left side. On the MSX, we had to make a custom kick stand mount on the swingarm. However, with the USA bike, it has a kick stand switch... so you will either need to bypass that, or extend the wiring back to the swingarm if you decide to use the swingarm to mount it. We are working on a kick stand solution, but that is still a little bit of time out. Another thing to consider, is header height... the stock header will be WAY too low... even if you modify it like we did on the white bike before we got the HotLap exhaust. A custom exhaust may be required for this setup, or heavily modifying an off-the-shelf header may need to be done. The only header/exhaust that is KNOWN to fit this bike, is the HotLap exhaust available through MiniMotoLab.com, as that exhaust was made specifically for this setup. You will not be able to run the stock front fender without custom brackets to fit whatever fork setup you decide to use. You will want to run a stiffer rear shock, or add pre-load... this will give you better ground clearance while riding the bike. You WILL have to flip the wheel around so the rotor is on the other side of the bike from stock, which will also mean you will need to flip the tire on the wheel before going back out for a ride so the tire is rolling the proper direction! DO NOT use forks from overseas that locate the axle BEHIND the centerline of the fork... if you do, the tire will hit the cylinder head... some forks extend the axle to the front side of the fork, and these would be ok, but you will be changing the rake of the bike, and it will handle differently. THIS IS NOT FOR EVERYONE!!! If you enjoy popping wheelies, stunting, dragging knee in corners, etc... don't bother with this setup... If you are looking for simple bolt-on, this setup is not for you... there is a fair bit of "figuring" that you will need to do to get this setup to work on your bike!